With autumn in full force, the leaves are turning colors. I love it when God paints the tress. Have you ever wondered how he does it? Last year we did an experiment that was so fun we did it twice and the kids want to do it again this year. We used chromatography to extract the different colors that are in leaves. Chlorophyll is what causes the leaves to look green but when the chlorophyll breaks down in the fall, the leaves' true colors shine through. 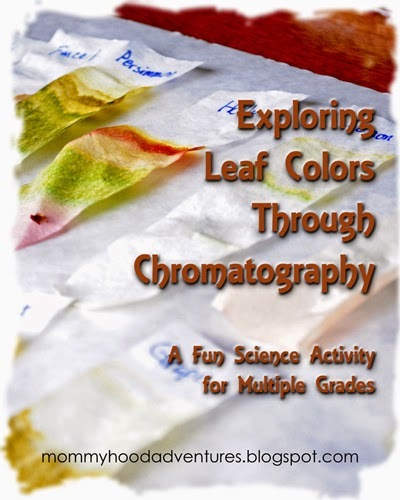 Extracting the chlorophyll – greens, carotenoid – yellow & orange-red, and anthocyanin - reds from the leaves is a really fun, easy, and inexpensive science activity. First, talk to your kids about why leaves are green and photosynthesis and the wonderful changes that happen during autumn. Check out books from the library about leaves and the changing seasons. Go for a nature walk and check out all the different leaves. While you are out and about (or even in your own backyard) gather leaves from different types of trees outside. If you can identify the trees that the leaves come from, that is great. If you can’t figure out what the trees are, that’s okay. Try to collect leaves that haven't turned yet. We collected from all around our area. We had so many leaves it was kind of crazy. As you gather the leaves, remember to keep them sorted so they can be identified later on. I asked the kids what colors they thought each leaf would turn when it was time and we discussed our hypotheses and why we came up with the answers that we did. Do all the prep for the experiment. Cut a coffee filter or two into strips. Gather some small glasses, a deep dish or pan, and grab some rubbing alcohol. You will need something to cut the leaves into tiny pieces and something to smash them when they are in the cups. Boil some water for later. While the water is boiling, have the kids cut up the leaves into tiny pieces - we used scissors. Place each cut up leaf into a different cup. We used shot glasses because I just happen to have a bunch of them (they are great mini beakers) but you can use any small glass container, like baby food jars. I haven't tried small paper cups but they might work. Smash the leaf a bit; this just helps break up the cellular structure so you can get a more vivid result in a shorter amount of time. Put a coffee filter strip in each cup with the top labeled with what leaf is in the cup. Now is when you will be glad you kept them sorted. Put all the cups into a deep dish or pan. We used a pie plate. Pour some rubbing alcohol into each cup. I didn’t really measure this but it was probably a couple tablespoons per glass. I made sure all the leaves were well covered; this is what will extract the color so you don't really want to skimp. Remember, rubbing alcohol is not something you want your little ones to handle. Please be careful and keep it out of their reach. Supervise the older kids while doing this. Pour the boiling water into the dish or pan that the cups are in. The heat helps the rubbing alcohol do its job. Let the cups sit for anywhere from 30 minutes to a couple hours. Until some of the alcohol has been absorbed by the coffee filters and you see some color spreading up the filters. Pull out the filter strips and let dry. You will see all the colors separated out. Some will be more vibrant than others. If you use leaves that haven't changed yet, they will give the best results I found. You can also test to see the difference between the same type of leaf during the different stages of color changing. 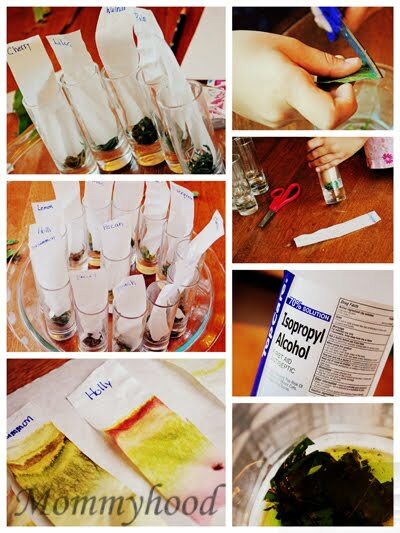 Depending on the age of your kids and what you are studying, you can go into all sorts of scientific studies, from the basic what color will it turn to how much of each compound is in each leaf to even why the alcohol worked. It's all up to you. Like I said this was really fun to do and the kids asked if we could do it again this year. 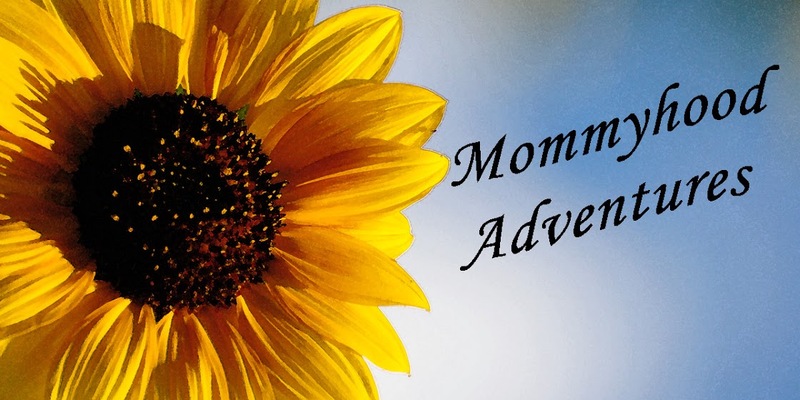 hosted by the Nesting Place. What happens when life gets in the way of blogging? Posts that were supposed to go up in October being posted in November.